Our new emergency T type hammer is provided with a quick removal clip fixing bracket for easy installation in vehicles such as coaches, railway carriages and similar where hardened tip hammers are a vital safety feature for exit through toughened glass windows. They are TUV tested for 5mm safety glass. The T type hammer is complimented by a pistol grip anti-vandal version with wire attachment reel preventing removal, both types are offered with matching clip mount. The T varient hammer weighs 72 grams – to enable comfortable use by people of varying age while providing sufficient impact force to break glass quickly. Handle colour is red for easy identification. 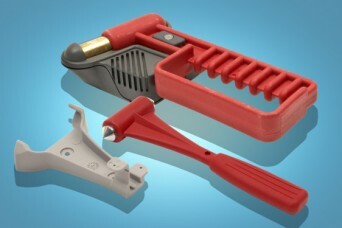 Share the post "New Emergency Hammers"